It’s important to keep your information in C2HR up to date so you don’t miss out on news from Human Resources and its benefits providers. 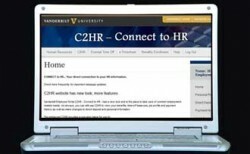 As a result, all Vanderbilt employees are encouraged to periodically review and update their personal contact information in the C2HR system. Take a moment to quickly verify or update your home mailing address, the way you would like to receive information and who to contact in an emergency. After logging in, simply click on the “Personal Profile” link in the right sidebar and make any needed updates. If you have an apartment number, please use the second line of the address field to enter that information. Select “Personal Profile” in the menu box. Select “Edit” at the bottom of the page. Make changes to the “Personal Contact Information” section where contact information on file is listed. Select the checkboxes for the devices/contact points on which you wish to receive AlertVU (or Non-Emerg) messages. You may also add additional contact points. Select “Next” at the bottom of the page. Finally, select “Confirm” to save your entries.